A water protector stands where the road was cut off to the DAPL construction. Melissa Carroll is a freelance writer, poet, and yoga instructor from Tampa Bay. Even though Standing Rock is no longer front page news, the momentum of a movement that shook numerous communities awake is still felt through the photos, art, videos, and documentaries sparked from the historic protest. These visual mediums, both artistic and journalistic, have been instrumental in shedding light on the ongoing struggles native peoples have been facing for generations. Currently, the first veins of oil are set to course their way through the Dakota Access Pipeline. After the camp was razed, what is left? For indigenous peoples and advocacy groups, the fight still wages despite the executive order that expedited construction of the DAPL earlier this year. For photographers and videographers like Daniel Veintimilla, the images and video footage captured will continue to tell the story of Standing Rock, and potentially help bolster current protests against the Keystone XL pipeline, the Bayou Bridge pipeline, and other projects that threaten water quality, land use, and indigenous rights. A view of the front lines of the Standing Rock protest across the Cannonball river. Last fall, when the already-volatile tensions at Standing Rock were escalating and the outcome was yet unseen, Veintimilla got a call. Violeta Sánchez, his friend from Ecuador — where Veintimilla is originally from — works for the non-profit organization Tejiendo Lazos (Weaving Ties), which supports indigenous communities in Asia, the Americas, and Africa. She told Veintimilla the group urgently needed an English/Spanish translator and videographer who could accompany leaders of two major indigenous organizations from Central and South America to the Sacred Stone Camp. Candido Mezua and Adolfo Chavez with a young water protector signing a drum as a symbol of solidarity. They connected their mission of solidarity to the metaphor of the condor and the eagle, which stems from an ancient Amazonian prophecy. According to the legend, about 500 years ago humanity split into two paths: the people of the north, characterized by the eagle, and the people of the south, characterized by the condor. The prophecy claims that during a half-millenia span of suffering, the people of the eagle will nearly decimate the people of the condor in the name of industry. However, the prophecy adds that a second span of 500 years would give rise to a unique opportunity for harmony, peace, and understanding. We are currently at the nexus between these two moments in time. For Mezua, Chavez, and the other leaders, this metaphor offers a distinctly hopeful message for the mission of those at Sacred Stone Camp. Indigenous peoples from the Amazon to Standing Rock and beyond share a great deal: a history of oppression, an encroachment of their sacred lands, and a persistence to protect their ways of life. As the conflict at Standing Rock swept international headlines in 2016, the Central and South American tribes were moved by a sense of empathy, unity, and solidarity — though they weren’t surprised by the turmoil. 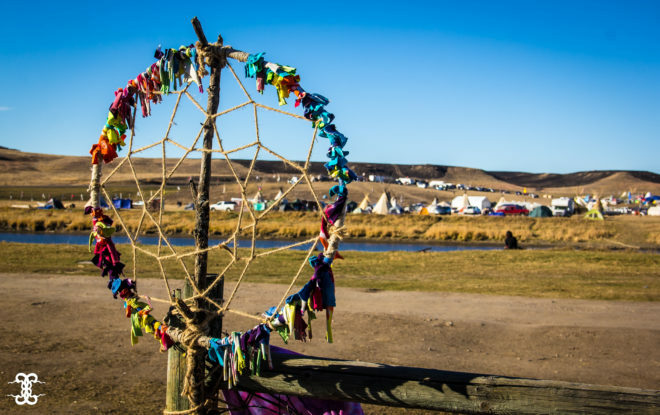 A dream catcher hangs near the river, by the camp, on the opposite side of the conflict. Photo by Daniel Veintimilla. 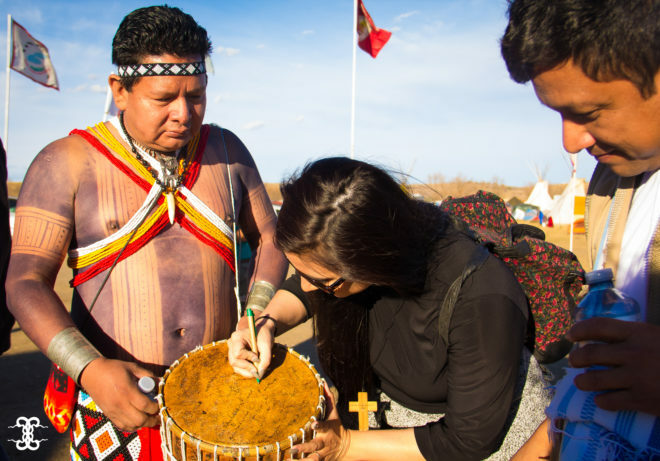 One of the most evocative non-verbal symbols of support and connection was a traditional drum, brought by the Central and South American leaders, and signed by water protectors from all different nationalities. The drum then traveled to Marrakech, Morocco to the United Nations Climate Change Conference, along with a video Veintimilla produced at the camp. 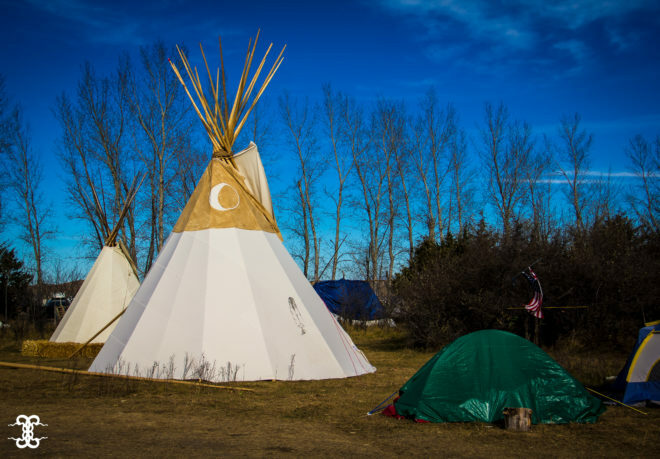 Tipis at the youth camp at Standing Rock. Photo by Daniel Veintimilla. Through his photography and videography, Veintimilla was able to capture the spirit of Standing Rock in the dusky landscapes, the tipi settlements along the freezing Cannonball river, and the unwavering resolve held in the faces of the native peoples. He carried his camera to the front lines and back to the various sections of the widespread camp. These photos serve as artistic artifacts that can continue to inspire supporters and sustain advocates, whose work is far from finished. On May 10, 2017, thousands gathered in Washington, D.C. for the Native Nations Rise March, which included erecting a tipi in front of the Trump Hotel.